Under continued lobbying from the Church Federation, the city attorney is preparing new restrictions on prizefighting that local promoters say will kill the sport. 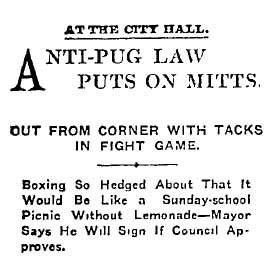 “The new ordinance hedges the boxing game about with sufficient restrictions to make the bouts uninteresting to the average gallery fiend who cares only for the bouts that furnish a few buckets of blood with each round,” The Times said. Matches cannot be more than 10 rounds. No gloves less than 8 ounces. No decision rendered by the referee as to who won—in other words, one fighter must knock out the other. Minimum, up to Welterweight, 8-ounce gloves; Super Welterweight to Heavyweight, 10 ounces. 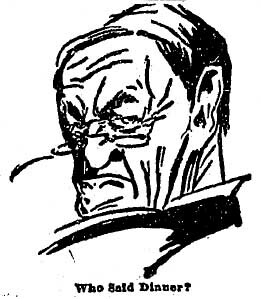 The judges shall keep score and shall decide on the result of the bout using the score system known as the "Ten-Point Score System."